My First Marathon This past weekend, I ran my first marathon. 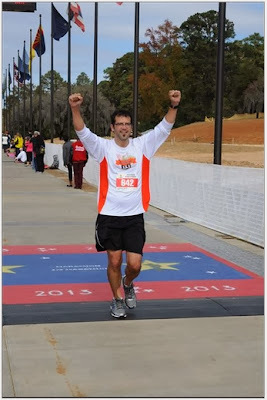 I chose the Soldier Marathon in Columbus, GA because it's a flat course, an easy drive from Atlanta, and got such great reviews online. I found it to be well deserving of it's reputation - it was run well, the volunteers, soldiers, and drill sergeants were all great, there were plenty of aid stations, and the course was beautiful. The hotel room I booked smelled bad and did not have enough room for my family.I was able to find another hotel further away but it was more than double the price.I got stuck in horrible traffic, because unfortunately, there was an accident involving a fatality that closed off a road.I only had two meals purchased for the pasta dinner and there were no more tickets available for the rest of my family. I didn't get to eat elsewhere until 8 PM - much later than I had planned.